A chance meeting some years ago with an Iranian scholar who, as fate has it, now lives in Helsinki, Finland, introduced me to an aspect of Iranian history, which to this date is nothing short of a love affair with my ancestors. Though long forgotten, they deserve to be remembered for what they truly were. For this enlightenment, I am forever indebted to this friend. At this particular time of year, I would like to share something with you that I think speaks volumes of plagiarisms and outright thefts of many Iranian thoughts and customs. I feel sure that many of you are aware of this, but circumstances have made it difficult to assert the facts or to remind your colleagues and compatriots of them. When my children were growing up and were still at home, as parents, Christmas was a difficult time for us. Like all other Iranian children, ours could not quite understand the lack of enthusiasm during this particular holiday. I am inclined to think that this, among many others, may have been the main contributing factor for their feeling that their parents were "different". They wished we would make the same efforts at Christmas as other parents, but because our hearts were not in it, everything we did seemed either artificial or pretentious, which made us in their eyes even more "different". However, the chance meeting changed all that with the result that a small amount of research produced many sweet historical facts. Had I known this when my children were small, I would have happily, gladly, and most proudly celebrated this particular holiday season as one of our very own. And I would not have had all those uncomfortable feelings at Christmas with or without a tree. Yalda (winter solstice) is an ancient Iranian word and appears in many of Prophet Mani's writings. The word refers to a new Beginning from which the Arabic words milaad, tavalod etc. were derived. Mitra (or Mithra) the early Iranian Prophet, considering Light as the essence of existence and life, believed in its sanctity. The Sun as its most obvious manifestation was revered and some out of pure ignorance concluded that Mitra worshiped the Sun. Whether she did or not she was believed to have been born by divine gesture on December 21st, the longest night of the year, specifically to begin the struggle and triumph of "Light" over "Dark" by having longer and longer days following the longest night of the year. Mitra's birthday was celebrated for a total of 10 days up to and including the First of January. It is not an accident that half way through the celebrations, namely December 25th, was chosen as Jesus' birthday and January 1st as the first day of New Year. Remember that Romans, prior to Christianity, practiced Mitraism and only out of political considerations, in the year 376, they converted to the new religion that had started within their own territory. They were not too happy about their main philosophy and religion having been imported from their main and only competitor, namely, the Persian Empire, they converted expeditiously. According to one source, the Iranians celebrated this day as early as 2,000 BC. Zoroastrians after refining and discarding some of the mythical and "heretical" aspects of Mithraism, retained Yalda (The Birth), and additionally encouraged celebrations of Noruz and Mehregan among many others. Ancient Iranians celebrated Yalda by decorating an evergreen tree, the Sarve. The Sarve, Rocket Juniper (what a name! ), also known as the cypress tree, being straight, upright, resilient and resistant to the cold weather (all signs of strength and upright of character) was thought appropriate to represent Mitra, the omnipotent and ubiquitous deity. The younger girls had their "wishes" symbolically wrapped in colorful silk cloth and hung them on the tree as offerings to Mitra with an expectation, no doubt, that their prayers would be rewarded (remnants of this traditions can still be seen in Iran at remote villages where some young girls tie colorful bundles to trees to answer to their "wishes") . Thus the tradition of decorations of the tree with lights and gifts on or beside the tree was born. As you may know, Pope Leo, in the fourth century (A.D.376), after almost destroying the last temple of Mitra (Mitraeum) in his campaign against Mitraism and in the good old Christian tradition, "If you can't claim it, imitate it and call it your own," proclaimed the 25th of December as Christ's birthday and January 1st (not March 21st as was the norm) as the first day of New Year. Again in the same Euro-Christian tradition of not identifying the source, Luther, the famous German reformer, in the 18th century (1756, I believe), having learned of the Yalda Tree tradition, introduced the Christmas tree to the Germans. However, as Sarves were not much known in Germany, nor indeed in much of Europe, the chosen tree became a genus of pine, abundant in Europe. So now with or without the children at home, we decorate a small Sarve with a star (Mitra's) on top and many presents all around, not necessarily for Mitra, but in memory of my ancestors for my children and grandchildren. Please, therefore, decorate a tree at this joyous time, call it by its true name -- Yalda Tree -- and celebrate it as your own and don't feel ambivalent when your children wonder if we celebrate the occasion. So Happy Yalda and the greetings of the season to all of you; no matter what your religion. This article is a revision of the earlier "Merry Mitra". Slight correction to the above, Saint Bonafice is credited with introducing the Christmas tree. Martin Luther put a candle on the tree which was an existing pagan Germanic tradition. One of the most venerated visual symbols of Iranian art is the tall Cypress tree, found in many Zoroastrian tapestries and reliefs, also found in much of the religious art from Pre-Islamic Iran. The Cyprus is an ancient symbol of male virility and fertility in Iran. It symbolises health, virility and long life. Even after Islam, the symbol survived in miniatures, carpets and tapestries, it can even be seen in Saffavid art. It is a very important visual symbol in all Iranian arts. Interestingly enough the Parsis of India (Zoroastrian descendants of the Persians who escaped the Islamic invasion and settled in India) have a very interesting story about the Paisley. According to them the Paisley was born after the Islamic invasion of Iran, when the tall proud Cypress of Iran was then depicted as bent over crying, which is basically the shape of the paisley. The Parsis used the Paisley symbol to show their sorrow over the invasion of Iran by Arab/Islam and their life in exile. The symbol then spread to the rest of the Indian and Iranian arts. Today the paisley continues to be a prominant symbol in most Persian and Indian arts, and the tall cypress is seen in Parsi religious art, and it survives in Iran in the form of tribal carpet and tapestry patterns, alongside Zoroastrian art. The tall Cypress is also often depicted on either side of a Faravahar as guardian pillars in many zoroastrian art works. In carpet and tapestry design it is depicted with a central composition and framed with a border, or it is mixed with other plant and lower symbols in an all over composition. Zarthustra himself is puported to have planted a cypress which became the biggest and oldest ree in Iran which in turn was then cruelly cut down by Abbasid caliph Mutawakki. Cypruses are a very common symbol on older and more antique carpets and rugs of Iran. If I was to pick a visual symbol that would best define the thousands of years of culture in Iran it would most likely be the tall cypress. It symbolises many traditional favorite beliefs such as love of nature, virility, health, strength, courage, long life, and the remarkable survival of the culture despite the many invasions and attempts at its elimination. Tree Planting Tradition in Iran To Commemorate Tree Planting Day, 15 Esfand(6th March) Since long ago in Iran planting trees and other vegetables has been of particular interest and importance. Just as you see the symbol of the tree of life or Sarv(Cypress) in the ancient images and ruins like the Hakhumaneshian main masonry in Persepolis. Because it is evergreen, Sarv has always had a particular importance in Iran. There is a 4000 year old Sarv, also called the Zoroastrian Sarv, in nearby Abarghood (Yazd). In addition to the images and masonry you can also see in textiles a kind of tree or plant symbol of a curved Sarv, later called the Tarma. Trees have a special place in other Iranian art forms like Miniature. In Avesta they believe one of the 6 processes of creation to be the creation of plants. In the ancient Zoroastrian belief the Gaahanbar(face) ayah Sherem celebration sometimes equals the 4th process of creation and is at the time when god created plants and vegetables. Therefore narrative celebrate in these 5 days and thank god for the creation of plants. Planting vegetables and trees has been prevalent since old times in Iran. Such as on the birth of a new born baby, each Zoroastrian person had a duty to plant a young tree, mostly a Sarv, naming it after the baby. As the sapling grew into a tree, so would the child into a grown up. Tree planting is one of the New Year ceremonies which has been prevalent among Iranians since ancient times. About 25 days before Norooz(new years day) 12 pillars, out of the mud bricks around the court yard, would be erected and on top of each pillar a kind of cereal grain would be planted.. on the 6th of Farvardeen month or Khordaad Rooz(day), while singing and playing their instruments, they would take the crop. The pillars would stay up until the 16th. By looking at the growth of the grains they would augur that which ever had grown taller and fuller would give a better harvest that year. In Avesta , Foroogh or the guardian angel of plants on earth is Khordaad Emsha Sepand. Khordaad being the Avesta diction, Hayah Orotaat meaning eternal life, and plants are a symbol of that and a sign of life and being eternal. When the barbarian Arabs invaded Iran, it is said that they cut down a very old Cypress tree that according to legend, had been planted by Zarathustra himself. The Cypress tree is the symbolic tree of Iran. Like Iran, it is tall, slender, beautiful, and evergreen. Like Iran, when strong winds come, it may bend and sway, but never breaks, because of its strong roots. I have 10 Cyrpess trees planted in my backyard. Every time I look at their majestic beauty, I am reminded of Iran. Painters and visual artists have also focused on to the cypress tree and adopted it as one of their favorite theme. Whenever a painter has tried to depict paradise or an idyllic realm, he has populated it with tall cypress trees, and architects, stucco-makers and tile-makers have amply utilized its form in their creations, and women have woven colorful cypress trees in their textiles or carpets. Adding the rows of cypress trees adorning the walls of Persepolis, depicted under the guard of Persian soldiers, to the cypress trees remaining from the Islamic period, one better realizes the eternality of the cypress tree in Iranian culture, and becomes even more eager to discover the secret of this eternality. In this quest, one comes across more historic events related to the cypress tree. One of these is related to the cypress tree of Kashmar, the felling of which gave birth to a great tragedy in Iranian culture and literature, inspiring many poets and writers. This cypress tree had been planted by Zoroaster. According to historic narratives, during his lifetime the prophet Zoroaster planted two cypress trees as good omens: one in Faryumaz (west of Sabzebar) and the other in Kashmar (south of Mashhad). Both were amazingly large. Upon hearing their description, the �Abbasid caliph Al-Mutavakkal� had ordered the cypress tree of Kashmar to be felled and its wood to be brought to him Samarra. He had recently begun the construction of the Ja�fariyah Palace and intended to have its wood used in it. But the description of the majesty of the felled tree was such that he decided to have its pieces reassembled for him to contemplate. She he sent the message to his appointees that no part of the truck or its branches should be discarded and that they should be packed in felt and sent to him, so that the carpenters of Baghdad could reassemble it with nails and make it possible for the caliph to see it at close range. �Ali Ibn Zayd Bayhaqi� has recorded this event, a momentous happening at the time, and given precise indications concerning the tree�s dimensions and the method used to fell it. As Bayhaqi writes, its circumference measured twenty-seven tazianebs and ten thousand sheep could rest in its shade. There were so many birds and wild beasts among its branches that their number could not be recorded. Of-course, felling such a tree was not a simple matter and required special tools and great skill. For this purpose, a master carpenter by the name of Hossein Najjar, who lived in Nayshabur, was called. Hossein spent a long time preparing a special saw. Learning of the caliph�s decision, the Zoroastrians gathered and went to see his emissary, Aboltayb, whom they implored for the caliph�s mercy. They were even prepared to pay iffy thousand Nayshabur gold Dinars, but Aboltayb remained inflexible. He said: �The caliph is not one of those rulers whose orders can be cancelled!� and reiterated his order to fell the tree. Bayhaqi has written that, when the cypress tree was fe3lled, earth tremors were felt, water springs and buildings were severely damaged, . and all night long all kinds of birds gathered, so that the sky was filled, and raised such a loud wail in their own voices that people were astonished. Bayhaqi has also left behind figures concerning the costs of felling and transporting the tree. According to these, felling and transporting it from Kashmar to Ja�fariya cost 500,000 dirhams and 300 camels were used to carry its pieces. Despite these expenses and efforts, Al-Mutavakkal never saw Zoroaster�s cypress tree. When it was only one stage away from Ja�fariyah, Al-Mutavakkal was assassinated by his slaves. Aboltayb, the carpenter and the carriers of the tree also met death in different ways According to Bayhaqi, the tree of Zoroastre was felled in AD 846 and it had been planted 1405 years earlier. On the basis of these figures, it was planted around 550 before BC. This date differs by only 33 years with the Zoroastrians� traditional date, because Zoroaster was born in 660 BC and was martyred in 583 BC, at the age of 77. 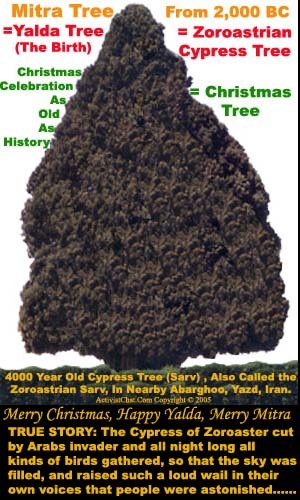 The cypress tree of Zoroaste was never forgotten by the Iranians. On the contrary, its memory grew ever stronger with the passage of time and poets and artists kept depicting it in their works. With the advent of the Safavid dynasty, and the ensuing reversion to Iranian national themes, the cypress tree of Zoroaster acquired further importance, but, owing to religious and political considerations, the name of Zoroaster was discarded and only its form was retained. Aware of the popularity of the cypress tree among the population, the Safavids took advantage of it to further strengthen the Shi�ite creed and introduced it in mourning ceremonies. A type of small metallic cypress tree, called �alam and incised with the names of God, Mohammad, Ali and their kin, was carried in from of mourning processions, and another type, which was made of wood, was called nakhl (palm tree). Traveling in the cities around the desert, one can see these nakhls in from of mosques and in public squares. A 12-meter-high nakhl stands in from of Amir Chakhmaq Mosque, in Yazd. This nakhl is believed to be 400 years old. An equally large nakhl stands in a public square in Taft and other similar but slightly smaller ones can be seen in Yazd, Kashan, Abuaneh and in Khorasan. On the day of the �Ashura they are decorated with expensive colored fabrics and carried in procession by the population. Almost all the men, old or young, join to carry the nakhl on their shoulders. Some nakhls weigh several tons. As for the appellation of nakhl, and why such an obviously cypress-shaped structure has become known as �palm�, we must once again turn to the Safavids and their aims. But, before that, one point needs to be made clear, namely that the cypress tree is the national tree of the Iranians, and the palm tree that of the Arabs. Therefore, if a scene of Karbala and the holocaust of the �Ashura is to be depicted, then the palm tree must be represented, and not the cypress. And this is the dilemma which the Iranians of Safavid times astutely resolved by adopting the cypress tree, a long-time symbol familiar to Iranians, and calling it a palm tree. In order to preclude any further discussion, once every year (on the day of �Ashura), this tree is given the appearance of a tent or a coffin and, by setting two cypress trees facing each other and covering the whole with black and green cloth, reminds the viewers of the tent of Emam Hossein�s family. Although this tent does not resemble a palm tree, it adequately does its job of evoking the �Ashura of the year 61 AH. On other days of the year, they are still called nakhl, but, without any decoration of covering, they are nothing but tall cypress trees, and cannot be unrelated to the cypress tree of Kashar felled by order of the caliph Al-Mutavakka. Rather than for its wood Al-Mutavakkal had the Iranians� dear cypress tree destroyed in an attempt to annihilate their beliefs and respect for nature and earth, little knowing that they would erect thousands more cypress trees in the squares of their own towns and villages. Beyond their names of Sarv (cypress tree) or nakhl, these wooden structures are the only sculptures of past eras in Iranian public squares; unique sculptures indeed, and I have seen innumerable sculptures in different squares across the world, but rarely seen masses as majestic as the cypress trees of Yazd and Taft, and as proportionate and harmonious with their surroundings.